Proper use of heaters in cabinets can improve reliability, efficiency and operational life of electrical equipment by preventing condensation inside the cabinet, thereby eliminating component and metal surface corrosion. However, the effects of too much heat and/or heat concentrated in one area of the cabinet can cause more harm than good. For anti-condensation purposes, the appropriate amount of heat needed should be based on the calculated power required (watts) to warm the enclosure to a temperature difference of 5 – 7 degrees Celsius above outside ambient temperature. Two types of heater technology are typically available for control cabinet applications: strip heaters and self-regulating Positive Temperature Coefficient (PTC) heaters. Strip heaters have been around longer, are based on a fixed resistance element and therefore operate at a fixed wattage output. This type of heater requires a thermostat to turn the heater on below a set temperature and off above the set temperature to control the enclosure temperature. Typically, strip heaters only provide radiant heat which result in extreme temperature gradients with the heat concentrated on equipment closest to the heater, while condensation can still form in areas furthest away from the heater. Excessive localized heating caused by strip heaters may result in the unintentional thermal overload operation of protective devices, such as circuit breakers, deterioration of cable insulation, and warping / melting of plastic components such as wire ducts. Terminal blocks and wiring closest to strip heaters are exposed to high temperatures, possibly causing thermal damage. When wire insulation is damaged, risk of faults increases as does the risk of equipment failure, both of which can negatively affect personnel safety. During cold weather, when a significant amount of heat is required to reach the thermostat setting, or in applications of continuous year-round use, a traditional strip heater is likely to drive the temperature of the area around the heater well above desirable levels. This can result in uneven heat distribution in the cabinet with areas measuring much colder temperatures further away from the strip heater. PTC heaters, on the other hand, utilize a variable resistance element that changes resistance in response to changes in air temperature. As the air temperature decreases, the resistance of the heater element decreases allowing more current to flow through the heater, which leads the effective watts in heat to increase. Likewise, as the air temperature increases, the resistance of the heater element increases, allowing less current to flow through the heater, which leads the effective watts in heat to decrease. PTC heaters are available with fans for circulating the air in the enclosure to produce a more even distribution of heat throughout the enclosure. Due to the variable resistance element, PTC heaters do not require a thermostat to control operation, but thermostats can be used in special applications where ambient temperatures can exceed 40C and supplemental heat in an enclosure is not required or to increase power output when temperatures are lower than desired. 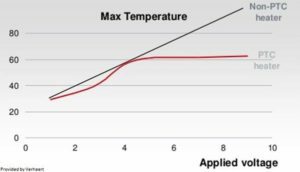 Below in the Max Temperature chart is a comparison between a strip (non-PTC) heater and a PTC heater, both without thermostats that can limit their power output. Depending on the ambient temperature, PTC heaters stabilize slightly above that ambient temperature, while strip heaters continue outputting as much heat as possible. Calculate the power (watts) needed for your particular enclosure size. For estimation of enclosure heat needed (based upon natural convection air moving less than 5 m/s), use this equation:Joules/Second = Watts = h x A x TWhere h = overall heat transfer coefficient W/(m^2K) – The value of h is difficult to calculate and is different for virtually every application; however, for rectangular outdoor enclosures with small amounts of venting and mounted to a vertical support, the typical value is between 5 and 10. Using 10 will represent a “worst case” scenario in a windier environment. T = Temperature difference desired (K) – For anti-condensation purposes, typical value is equal to 5. 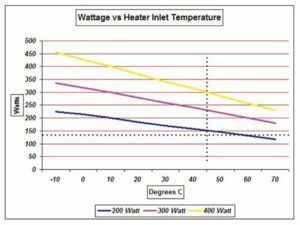 Draw a corresponding horizontal line on the selection chart (see Water vs. Heater Inlet Temperature chart below) based upon wattage calculated in Step 1 above. Determine the highest ambient temperature condition for the enclosure application and draw a corresponding vertical line at the bottom of the chart.EXAMPLE: The same cabinet in the example above is in a location where the higher air temperatures often reach 45°C. The vertical line should be drawn at 45°C and intersect with the 135 watt horizontal line in Step 2. Select the closest heater that intersects above and to the right of the drawn intersecting lines.EXAMPLE: The 200 watt heater would be selected for this application. NOTE – If high temperature operation would have been 65°C or higher, the 300 watt heater would have been appropriate for the application. Measures can be taken to prevent issues like high cabinet temperatures, so remember your options: Properly calculate and select the number of heaters and the type of technology you need in the cabinet, use heaters with fans to evenly distribute heat and consider adding thermostats to your heaters instead of selecting continuous use heaters to prevent overheating your cabinets.